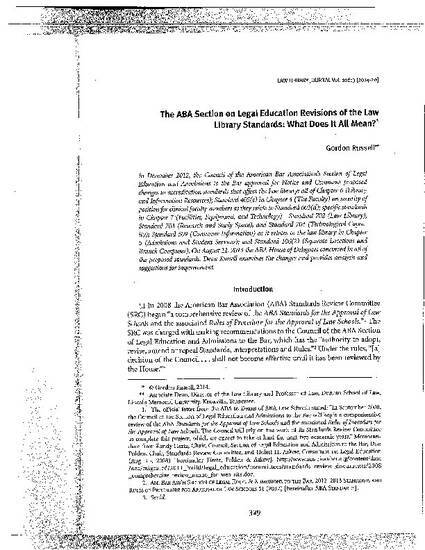 The ABA Section on Legal Education Revisions of the Law Library Standards: What Does It All Mean? The ABA Council on Legal Education approved for Notice and Comment proposed changes that impact the law library: all of Chapter 6 (Library and Information Resources); Standard 405(c) in Chapter 4 (The Faculty) on security of position for clinical faculty members as they relate to Standard 603(d); specific standards in Chapter 7 (Facilities, Equipment, and Technology) - Standard 702, Law Library, Standard 703, Research and Study Space; Standard 704 Technological Capacity; Standard 506 Consumer Information as it relates to the law library in Chapter 5 (Admissions and Student Services); and Standard 106(2) Separate Locations and Branch Campuses. Gordon R. Russell. "The ABA Section on Legal Education Revisions of the Law Library Standards: What Does It All Mean?" 106(3)Law L. J. (2014): 329-373.